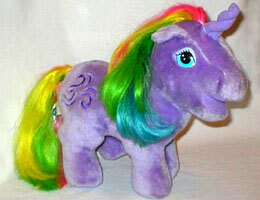 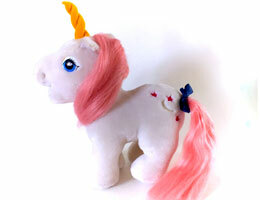 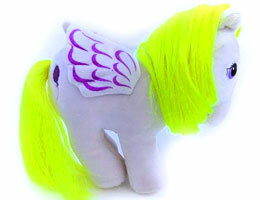 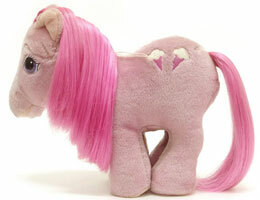 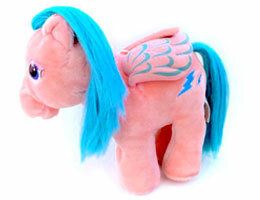 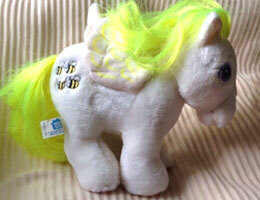 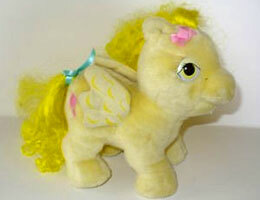 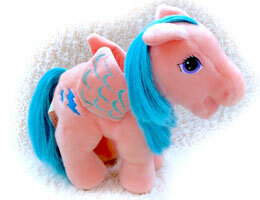 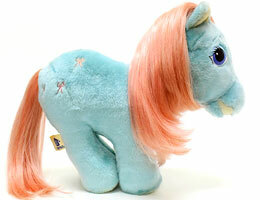 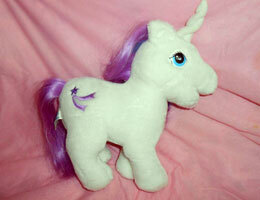 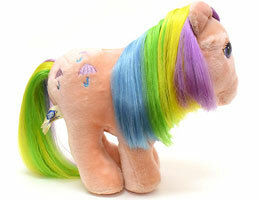 My Little Pony produced several Plush Ponies over production years 2, 3 & 4. 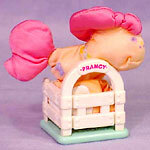 Most were by Hasbro Softies, but some were also made by Applause and had a slightly different look. 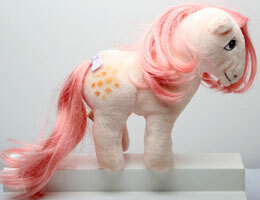 There were three plush earth ponies from Year 2 characters (Blossom, Bow Tie and Cotton Candy), with two more added the following year (Cherries Jubilee and Posey). 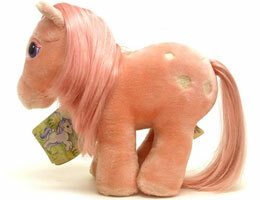 Lickety-Split was added in Year 4 and came with her own baby (more info lower down). 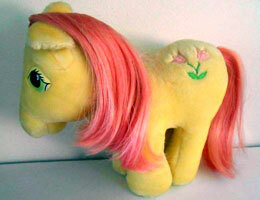 Each pony came with a flower shaped brush. 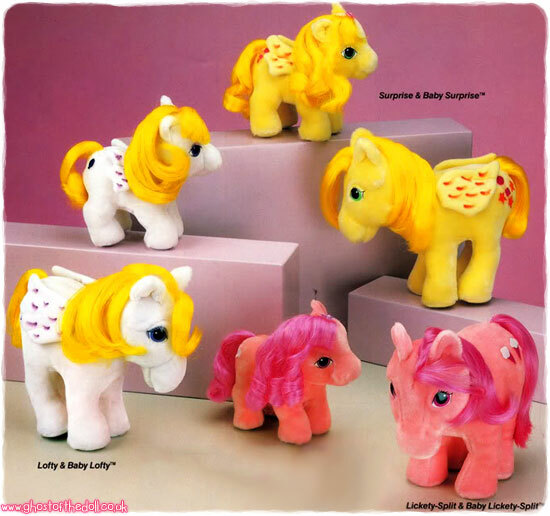 Blossom and Cotton Candy were also produced by a company called Applause (as opposed to Hasbro Softies) and had a slightly different look. 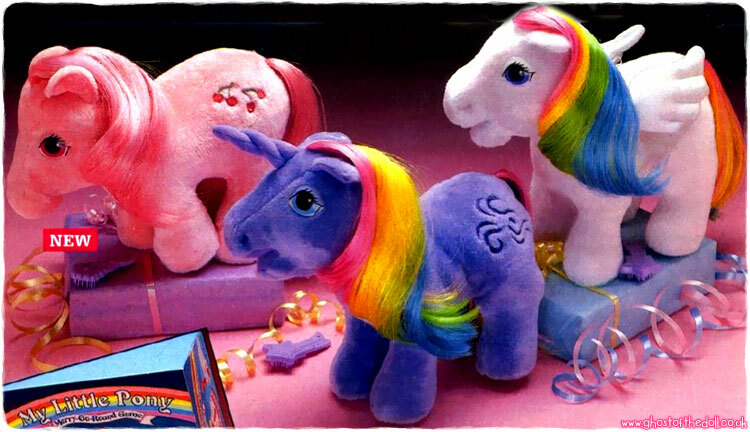 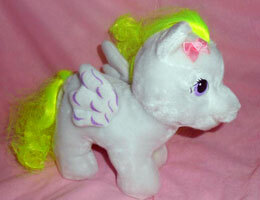 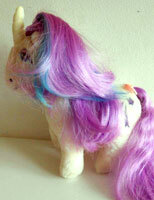 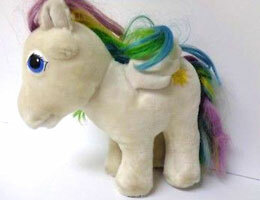 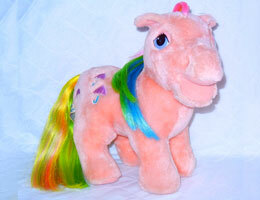 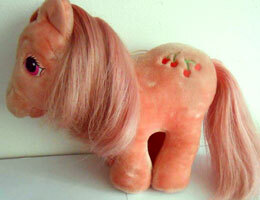 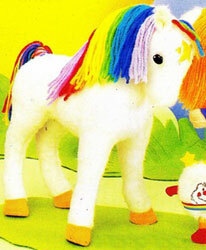 There were three Plush Rainbow Ponies, all characters from the plastic Rainbow Ponies series. 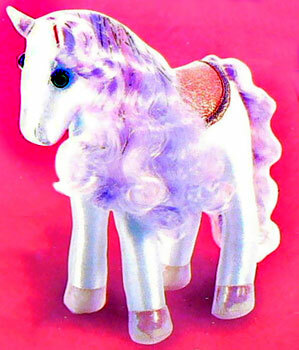 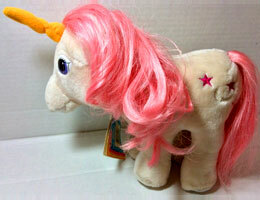 Each pony probably came with a shooting star shaped brush with a sticker on the back of a shooting star. 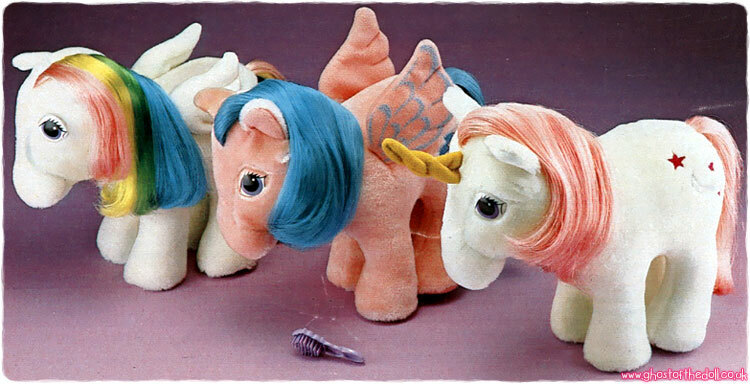 All three were made in a pose with their heads slightly to the right and their mounths open, and Parasol and Starshine were also made in the original straight pose with closed mouth. 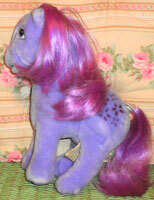 These two also had slightly different coloured hair (purple rather than where pink). 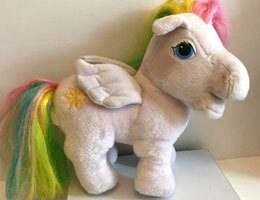 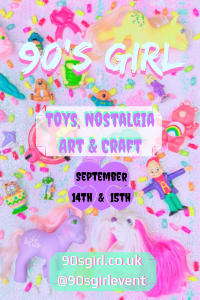 There was one Plush unicorn & two plush pegasi of characters from Year 2's Unicorns & Pegasi Ponies series and one pegasus from the UK/Euro My Little Pony set from Year 3. 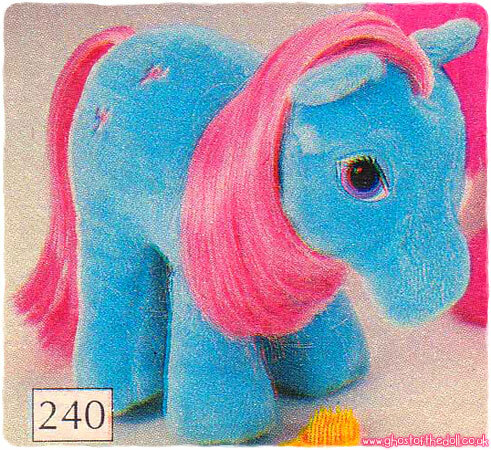 Each pony probably came with a shooting star shaped brush. 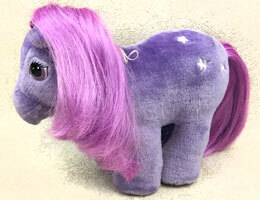 All three Year 2 ponies were made in a pose with their heads slightly to the right and their mouths open, and Firefly and Moondancer were also made in the original straight pose with closed mouth. 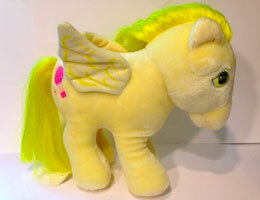 Glory and Firefly were also produced by a company called Applause (as opposed to Hasbro Softies) and had a slightly different look. 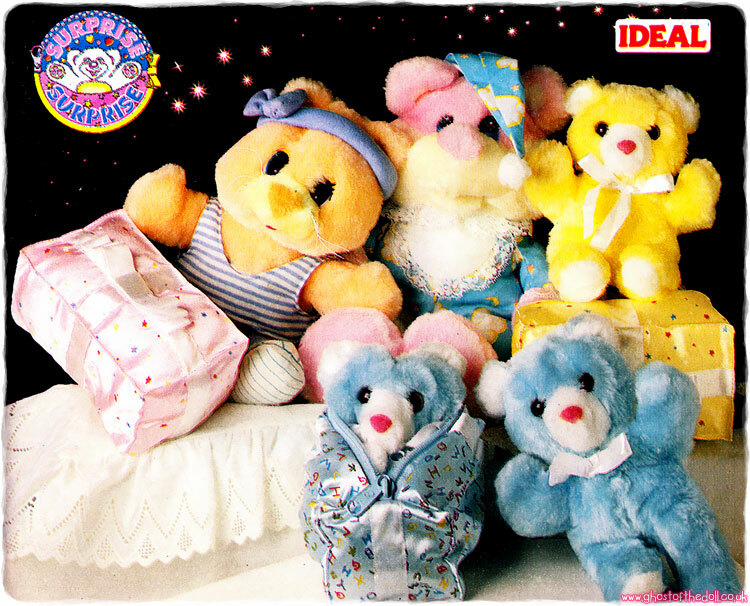 These two pagasi came with their own babies (see lower down). 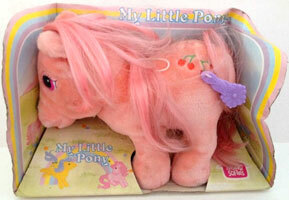 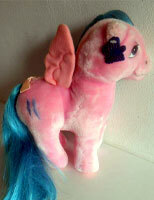 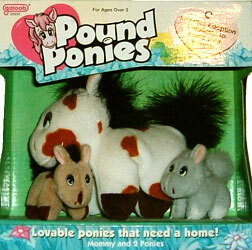 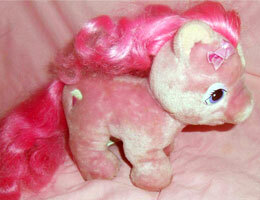 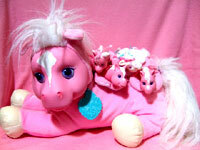 There were three sets of plush Mother & Baby Ponies featuring current characters from various Year 4 sets.